Dry Natural Hair? To Pre-Poo or Deep Treat? From a pre-poo to LOC to WNG, curly girls and their terms often run the gamut with acronyms and hair treatments that will do just about anything and everything to your curls. It can be somewhat difficult to figure it all out. Another issue would be when to use what and can they be in conjunction with others? Just looking at a term may not fully explain what it entails let alone what it will do, so when a confused curly girl comes across the Curly Q&A, it is our pleasure to try and help anyway possible. Curlypunk was interested in knowing the difference between a popular hair technique and an equally popular hair product. What’s the difference between a mask and a pre-poo? Is it ok to use a mask and a pre-poo in one wash? A pre-poo, which is short for pre-shampoo treatment, is quite similar to the traditional hot oil treatment many of our mother’s used for deep conditioning treatments that were applied prior to washing the hair. You can also cocktail or substitute the oil for a daily conditioner. They both hydrate the hair while combatting the dryness of the impending shampoo and in detangling prior to shampooing. A pre-poo can be a pure oil, blended oil, a conditioner, or even a conditioner plus oil cocktail. A hair mask or masque is a heavier-duty conditioner that restores moisture to the hair and closes the hair’s cuticle after using shampoo. Based on the manufacture’s directions, it is usually left on for 15-20 min. The ingredients in hair masks tend to be oils, butters, and even silicones that are ultra-conditioning and much thicker than deep conditioners. 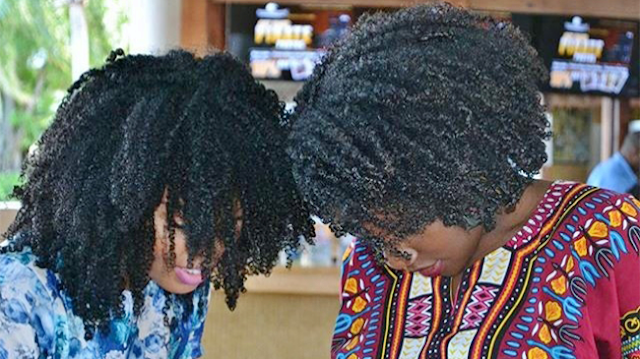 Because of this, curlies usually incorporate them in their regimen between weekly and monthly. Depending on the treatment, some are formulated with more hydrolyzed protein and ceramides for strengthening properties, while others focus on humectant, emollients, and oils for moisture retention. Some people apply conditioner before shampoo and this is called the reverse shampoo method. The difference between pre-poo and the reverse shampoo method is intention. Those who pre-poo are trying to either prevent hygral fatigue or lessen the drying effects of shampoo; there is no intent of eliminating the deep conditioning step after cleansing. With the reverse shampoo method, the cleansing is not followed up with a conditioner. It seems the biggest distinguishing factors between the two are when they are applied to your tresses and what they are used for. As I mentioned before, a pre-poo is for fighting dryness that one may incur from the upcoming shampoo or it can be just an aid on detangling the hair if it is pretty tangled. The hair mask or masque is more so to strengthen the hair and try to correct any imbalances within the hair just like a facial mask. What they have in common is that both can be DIY concoctions and they can be used during the same wash cycle as they do different things especially if using a hair mask that has protein in it. It may seem like extra work to use both but depending on your hair’s wash day needs, it may be necessary from time to time and if using a hair mask that only needs to be rinsed out may also determine if you want to do both. Here is a simple DIY pre-poo and hair mask that will work wonders on your curls along with some product recommendations. Mash up avocado, add oil, mix well, and sift with a rice strainer to remove the lumps. This pre-poo is even better warmed up. Apply to hair and allow to sit for at least 30 min. before rinsing and washing hair as usual. Mix ingredients well before applying to damp hair. Let sit for 15 to 20 min. before rinsing, washing, and styling as usual.